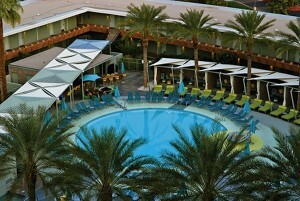 If you haven’t visited Scottsdale, Ariz., for the past decade or so, you are in for a treat. In a series of initiatives, the city has created a dynamic downtown that unites historic Old Town Scottsdale. It celebrates creativity with a vibrant arts district and public art throughout the city. And, at center stage, is the Arizona Canal. The result is a boon for tourists, who can walk or bike the downtown area of roughly one square mile. Or they can get around the area via the Scottsdale Trolley, with several stops along Main Street, Fifth Avenue and Marshall Way. In another smart move by the city, the trolley is a freebie. 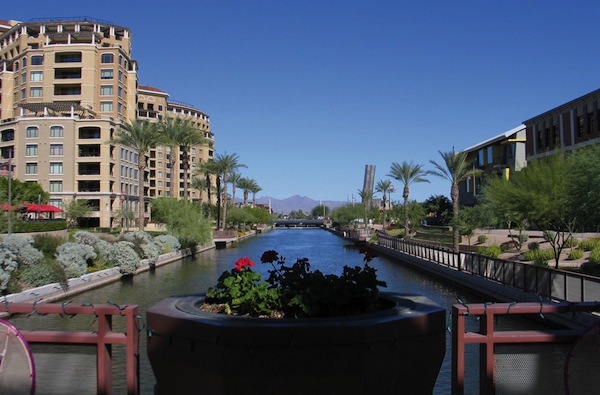 The canal that traverses Scottsdale has been part of the city landscape as long as anyone can remember, said Ace Bailey, who has been leading arts and cultural tours of the city for the past 11 years and who remembers when people water skied on the canals in the 1960s. “They’d attach ropes to cars that would ride along the side of the canal,” she shared. Scary stuff, best left in the ‘60s. But only recently has the city celebrated the waterways, realizing that water is a welcome site in an arid land, playing a role in vitalizing spirits, and calming psyches. Now they are front and center: On the north shore of the canal, the Scottsdale Waterfront district is a happening place in the city: the outdoor shopping mall with restaurants and retail has a full schedule of free entertainment. It also includes two 13-story residential towers of 99 units each, just one of several residential developments that bring urban living to the downtown. At the Waterfront, you’ll find diners at Olive and Ivy and other restaurants overlooking the action of bicyclists and joggers meandering along the banks of the canals. Across the waters lies the hip new SouthBridge community, a $41 million retail/restaurant development by noted Scottsdale developer Fred Unger, developer of the Royal Palms Inn and Hermosa Inn. The urban, pedestrian-friendly SouthBridge development occupying just three acres is notable in that it features only independently owned boutiques and restaurants: chains are not allowed. However, if you are having “chain withdrawal,” have no fear: you can get your fix at Scottsdale Fashion Square, the largest mall in the American Southwest with more than 2 million square feet of stores and restaurants, including anchors Macy’s, Nordstrom, Neiman Marcus and Dillard’s. You’ll also find lots of high-end luxury at this enclosed mall, including shops like Barney’s New York, Prada, Burberry and Tiffany’s. It’s on the north side of the Arizona Canal, adjacent to the Waterfront towers. Last December, the new Soleri Bridge opened, uniting the Scottsdale Waterfront to the south side of the Arizona Canal, which includes Old Town Scottsdale and the arts district. Paolo Soleri, one of Scottsdale’s most revered artists, was born in Turin, Italy, where he was awarded a “laurea” (PhD with highest honors) in architecture in 1946. He came to Scottsdale to spend a year and a half in fellowship with Frank Lloyd Wright at Taliesin West. Soleri settled in Scottsdale in 1956 and established the Cosanti Foundation, a nonprofit educational foundation dedicated to research and experimentation in urban development. Soleri’s 130-foot-long pedestrian bridge is anchored by two 64-foot pylons and is 27 feet wide on the south side narrowing to 18 feet on the north. The Soleri Bridge and Plaza incorporate hallmarks of Soleri’s signature style and is designed to “bring awareness of our human connection to the sun and the natural world.” The earth’s rotation each day and the sun’s location with relation to the earth are both keyed to the bridge’s true north axis location and the 80-degree angle of the pylons. This symmetry allows light to filter through the six-inch gap between the pylons to illuminate a red strip and move a shadow along the bridge. Each solar noon, which can vary up to 40 minutes from noon, light coming through the gap produces a shadow. Depending upon the time of year, the length of the sun’s shadow varies. At each summer solstice, June 21, when the sun is highest in the sky, there is no shadow. At each winter solstice, Dec. 21, when the sun is lowest in the sky, its shadow is the longest, reaching to the bridge structure. The red strip follows the shadow and perceptually leads the viewer across the bridge. A 22,000-square-foot plaza on the south side of the canal creates a pedestrian-friendly gathering environment with connections from Scottsdale Road to the Waterfront pathways. The public space is pedestrian and bicycle friendly as well as completely ADA accessible. The plaza also includes a portion of the regional, 141-mile Sun Circle Trail. Scottsdale has been designated as a Gold-level bicycle-friendly city, by the League of American Bicyclists, with 124 miles of bike lanes and 112 miles of paved bike paths. There are several areas in downtown to rent bikes. And beginning next year, Fit City Scottsdale, a nonprofit organization dedicated to making Scottsdale the “most fit city in the country” will begin bicycle art tours. surrealist-inspired scenes often featuring figures in Victorian dress. He was also the founding director of the Phoenix Art Center, which became the Phoenix Art Museum. Scottsdale Art District on Main Street and Marshall Way features more than 100 galleries that host art walks every Thursday night from 7 to 9 p.m. throughout the year. It’s a perfect time to visit the galleries, when many artists and gallery owners are available, with several in-gallery demonstrations. Scottsdale has one has one of the top 10 public arts programs in the country. One of the public arts programs that Scottsdale Public Art introduced last year, called IN FLUX, features the creation of huge installation pieces in empty gallery spaces, including an artist in residence. “The public gets to watch an artist in action, as he or she works on one of these installation projects,” said Bailey. This December, tourists might want to climb aboard “Celebrate Scottsdale, the Magical Holiday Tradition.” Every Saturday between Thanksgiving and Christmas (except Christmas Eve) horse and carriage rides will lead visitors on 40-minute tours of downtown between 1 and 4 p.m. Tours are $60 per the carriage, which will hold up to six people. The carriage makes a stop at Hotel Valley Ho, located at the tip of the arts district on Main Street, and the hotel is something that should not be missed. Better yet, stay there like I did on a recent visit and enjoy some of the best mid-century modern design you’ll see anywhere. Think of it as “The Jetsons visit the desert” décor. The Valley Ho often has music on the patio outside its signature restaurant and lounge, Café Zuzu. Designed in a Frank Lloyd Wright style by Scottsdale architect Edward Varney, the Valley Ho opened in 1956. 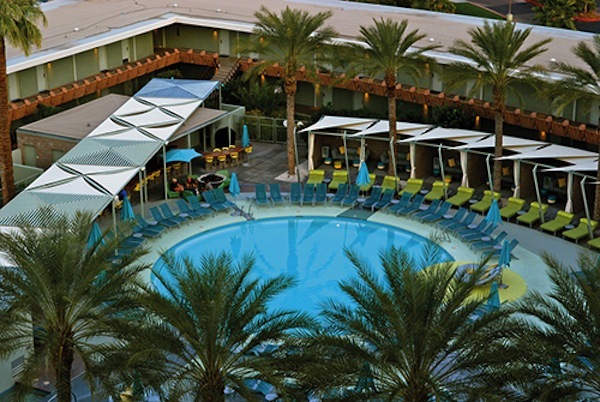 Robert and Evelyn Foehl built the hotel, one of the first year-round resorts in Scottsdale. Earlier, the Foehls had managed the Lake Arrowhead Resort in the San Bernardino Mountains, where many Hollywood celebrities would get away. And the Foehls brought celebrities to the Valley Ho. Jimmy Durante played in the lounge. Bing Crosby would walk around the grounds with his corncob pipe. Zsa Zsa Gabor was a regular guest, and her daughter, Francesca, enjoyed horseback riding around Camelback Mountain. Later, the hotel was sold and was known as the Ramada Valley Ho Resort, until it closed in 2001, and it appeared that the treasure would be lost. It took two years of planning and two years of construction and $80 million to restore the hotel. While retaining the wing of rooms that incorporate glass walls that open to patios overlooking the refurbished circular swimming pool, there’s also the seven-story Tower, an artful elite hotel within a hotel. It offers spacious one- and two-bedroom suites with complete kitchens as well as generously sized guest rooms. All rooms feature 32-inch flat screen HD LCD televisions, wireless Internet, floor-to-ceiling glass, and private patios or balconies.